I'm an enthusiastic fan of edcamps and the genuine alternative to traditional PD they offer. And being an edcamp cheerleader means I unabashedly offer my thoughts and takeaways from edcamp in an effort to get more of my colleagues to drink the Kool Aid. 1. Homework for a grade is NOT a valuable learning experience. I attended this session entitled "Evolution of homework: What do you assign, when, and how much? Are you flipping your content? Should you?" because I'm working with a very frustrated teacher who continually assigns homework that his students very rarely complete. Why continue the battle?, I ask. What's the point? Personally, I'm in the anti-homework camp; I see it as purposeless busywork. Too many teachers assign it because they feel they have to; too many students rush through it with the same apathy. As a parent, I know that I've spent more time than is ethically scrupulous helping my sons with theirs. Another teacher, firmly entrenched in the pro-homework camp, found a compromise with which his students can work: homework is optional, but students can't "level up" if they haven't mastered the standard associated with that homework. I like this gaming aspect of homework, and definitely think it has some merit on two fronts: mastering standards (not homework) and creating autonomy and accountability within learners. Finally, there's the option to simply not grade homework at all, but instead, to give priority to the summative and formative assessments. This was offered up by a teacher whose administration demands homework but who personally doesn't believe in it himself. The hour-long conversation was stimulating and thought-provoking. But homework, at least as it's still being assigned, is completely worthless. 2. If you want to transform the way your students learn, then transform your learning space. In October, I got the chance to visit a school that's completely dismantled and rebuilt learning spaces, and the two mantras from that visit I continually quote to teachers is the following: Get the crap off your walls and remove your teacher desk (aka "Fort Desk.") Teachers are infamous hoarders and we also have the antiquated notion that we need to cover every inch of our classroom walls with posters, banners, and student work. If I had my own classroom today, it would resemble an office space similar to Google or Microsoft: stripped down, inviting, and designed for collaboration. 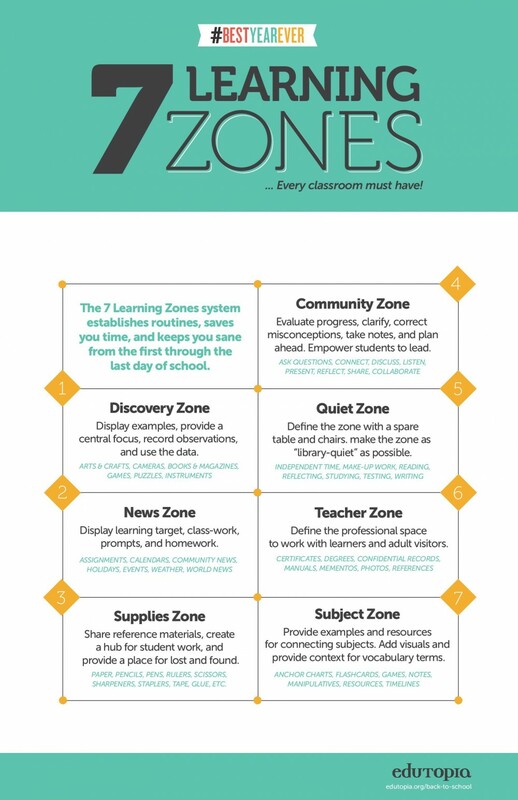 Oh, and with deliberate learning zones (or stations or pods...whatever you want to call them)! The teachers in the "Creating 21st Learning Spaces" session want to do the same. In fact, plenty of them already have! And the primary idea is to keep the space clean and simple to minimize the distractions. We also floated the idea of (gasp!) ditching desks. One teacher bought high rounds (like those found in pubs) for his classroom students who need a break from sitting. Another keeps a few exercise balls in the classroom; still another shared her story of finding "that room" in the building where all the castoffs go and finding tables to replace the desks in her room. Finally, one very brave teacher decided to put her money where her mouth is: the following Monday she said goodbye to her teacher desk for good! 3. If we ask teachers to change the way they teach, then let's change the way we teach them. The majority of my job entails reaching out to teachers, and my biggest concern is that many teachers limit themselves to the confines of the four walls of our classrooms. Literally. There's very little time provided to teachers to go exploring...both literally and figuratively. Two edcampCLE sessions helped me think of new ways to encourage both empowerment and collaboration: "Administration in the Digital Age. How do we empower teachers to be the best version of themselves without overwhelming them?" and "Break down those walls! How do we collaborate with other teachers in our own buildings?" If our goal is to make learning fun again, then let's make teaching fun again--without overwhelming our teachers by throwing a bunch of new tech tools at them and hoping something will stick. Let's face it: traditional PD doesn't work anymore. And quite frankly, I'm pretty sure most of the teachers I work with hear "I want to fix you," when I say, "You do this really well, and here's something that will make it easier and more fun for you." Have an edcamp for your district teachers. Host a weekly/monthly edchat on Twitter specifically for your district teachers. What about daily/weekly push notifications for mini-PD? Let's apply the concept of speed-dating to tech talks among the teachers: bring a tool to share with others. Partner teachers from different buildings/classrooms. There. The bags are unpacked. And I'm determined to not put those precious souvenirs on the shelf to gather dust. Thanks, again, EdCampCLE. See you next year!